This one we just discovered as we were cleaning our shed out. I thought that they'd long been sold, or gone. I compiled and published this CD Rom back in 2002 - I was cutting edge even then and anticipated the need for an E-Book to contain information that normally wouldn't either reproduce correctly in a printed edition or might be missed. Issued as an E-Book (CD ROM only) release in 2002, The Phantom: The Complete Collectors Guide, provides scans of every Phantom comic issued in Australia, complete with a price guide and several other bonus materials. There's write ups, histories, details of the artists and writers and a lot more - this is a great addition to any Phantom collectors shelf. Holy Cats! 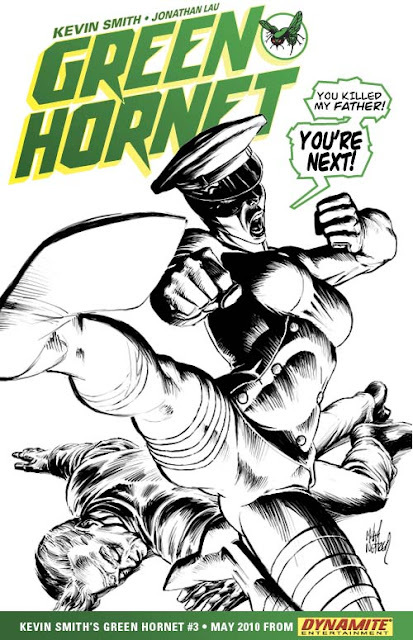 What you're seeing here are the pencils to four teaser covers for Kevin Smith's Green Hornet issue #3. The story is being discussed, in part, over at Bleeding Cool, but one thing Rich Johnson hasn't done is mention the stunning work by Michael Netzer. According to Michael, "They’re not the real covers, though they’ll be published with the comic book. They’re produced only to confuse and whet the appetite. I drew these two weeks ago and they’re now being inked by Joe Rubinstein. The art was produced on a computer as a pencil stage for Joe Rubinstein to ink from blue-line prints. Because Dynamite darkened my images to give them an inked feel for the press release, here they are below in their originally drawn state." Archie Comics sent this new release out this morning. More sad news. It all seems to hit at once really. It is with deep regret and sorrow that Archie Comics acknowledges the loss of longtime artist, Henry Scarpelli, of Grasmere, Staten Island who passed away on Sunday, April 4 after a long illness. He was 79. Scarpelli studied at the School of Visual Arts in Manhattan where he honed his pencil and inking skills. He would go on to pencil and/or ink several comic strips and comic book features over the years and even wrote a few as well. I'm actually quite excited here, but then it's not that difficult to get excited when you're starting an all new feature. 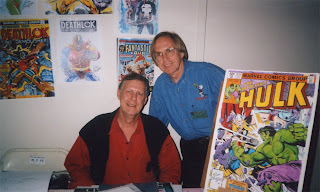 A while ago I was approached by Rich Buckler with the view of setting up a web-site that'd focus on his comic book art and work. For those who don't know Rich has been involved with comic books since the late 1960s, and has seen, drawn, written and edited it all. He's best known for his own creation, Deathlock, along with runs on titles such as The Fantastic Four, Batman, Superman, The Avengers, Spider-Man - hell, you name the character and Rich has drawn it. It really is as easy as that. Rich has worked at Marvel, DC, Archie, Skywald, Atlas-Seaboard and many other companies along the way. He's as prolific as they come - by his own estimate he's drawn over 400 comic books over the course of his long career, and he's not finished yet.